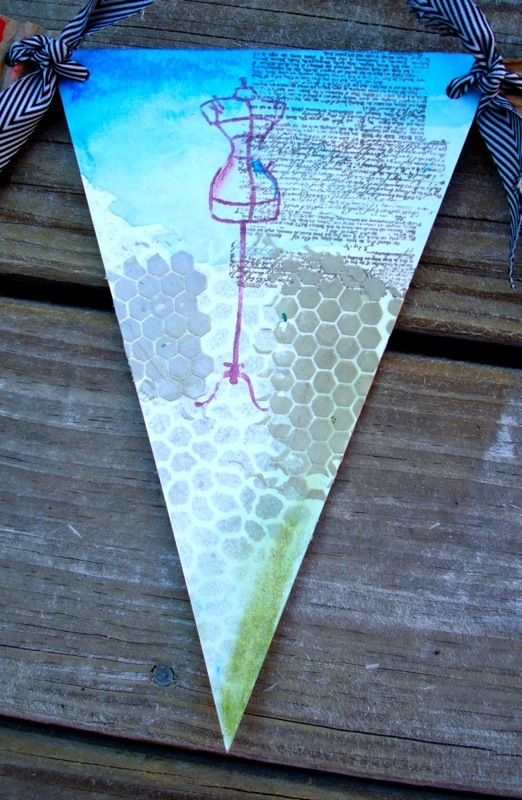 Art Talk: It's a Banner Day! I am so excited to share a project that grew while I was demoing Faber-Castell Design Memory Craft products in the Rubber Cafe booth at the Somerset, NJ Scrapbook Expo. I met Melissa there and it was a pleasure! Wish we had more time to chat but they were busy and I had to head home right afterwards. 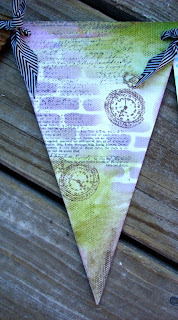 In the two days I was there, I created individual banner pieces using the Steampunk and Vintage Treasures stamps. I loved using these images on my projects! Here is my finished banner all put together and ready to hang in my art room! I used canvas, cardboard, matboard, and mixed media paper for the base. I just want to highlight a few of the pieces using the stamps from the two sets. This one is on a piece of mixed media paper (thicker and more rigid than watercolor paper) using Faber-Castell Big Brush Markers in Black and Nougat to stamp with. I then used Faber-Castell Design Memory Craft Gelatos in Yellow and Blue sets with water and foam brush from the Lil' Inkerz set. 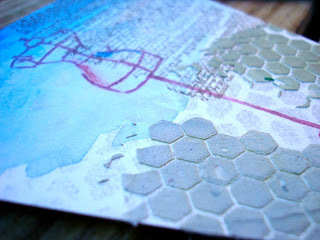 I also used a stencil to create the hexagons and dots. 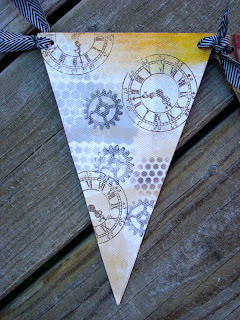 The gears are from the Steampunk stamp set and the clocks from the Vintage Treasures set. Here are a few more close ups of the banner pieces. Another using Gelatos to stamp with. 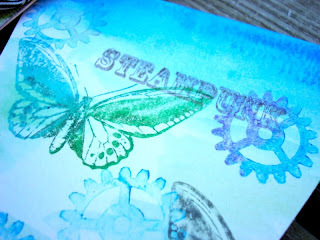 I just colored the stamps with a combination of colors and stamped them with a light mist of color on the stamp. 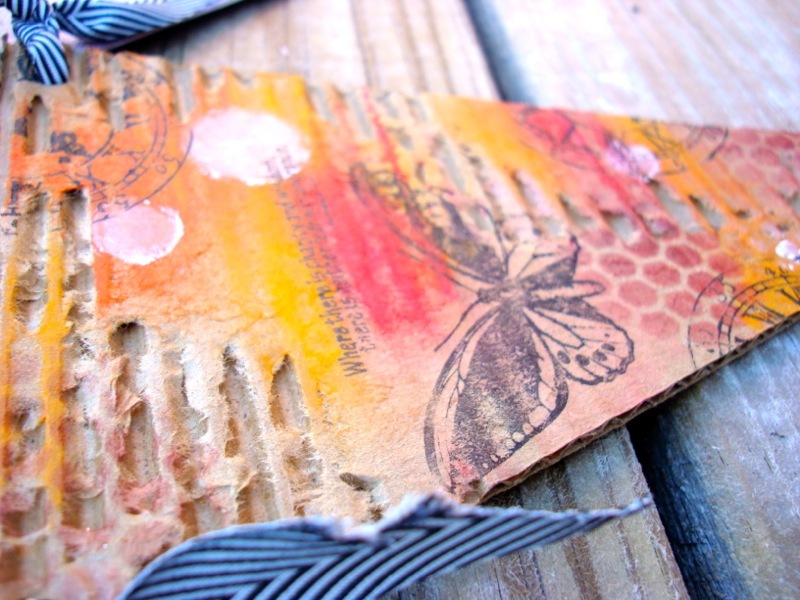 Peeling away the top layer of the cardboard in a few places gives texture and drama to a piece. 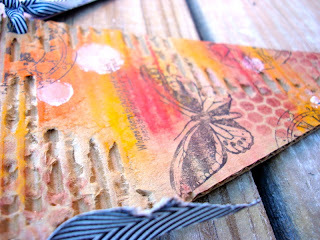 I then colored with Gelatos and stamped too. Another piece with stamping and Gelatos using the foam tool for a bold dramatic look. The colors are bright and I also used a text stamp that comes with the Steampunk set. Stamping with Big Brush Markers, washes of watered down Gelato, and colored modeling paste. I used gold and silver Gelatos to color on a mat and then added modeling paste to mix with them to customize the look. I used that stencil again! I love the different techniques that I can use with the stamps and hope to have some short videos detailing some of them in the near future! Stay tuned! Other: Crafter's Workshop stencils; Golden Light Modeling Paste, Faber-Castell Design Memory Craft Gelatos ( Blue, Yellow, Red, and Green and Metallic sets); Faber- Castell Design Memory Craft PITT Big Brush Marker in Black, Violet & Nougat. I second-hand gold and silver Gelatos to dye on a mat and then added model paste to mix with them to modify the look. 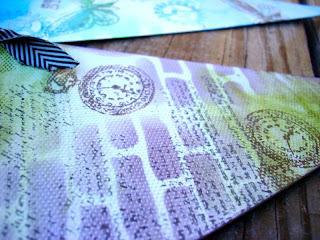 I used that pattern again College paper writing! !